You can get the image also from You are not allowed to view links. Register or Login to view. Sure the first line should be "nepenthes herba cuium"? Especially as the following text mentions Homer's Odyssey, in which the drug nepenthes appears. (15-04-2017, 11:20 PM)Emma May Smith Wrote: You are not allowed to view links. Register or Login to view. Sure the first line should be "nepenthes herba cuium"? Especially as the following text mentions Homer's Odyssey, in which the drug nepenthes appears. That's correct, it says "Nepenthes herba cuius..." and references Pliny (Plinius), Homer, and Galen (Galienus), etc. scribit quibus vino inmissa peticie causa sit. Vnde bibebant . Ire . Nepenthes . I was particularly perplexed by "conuiuii". I had no idea what that word might be. Even now I'm not sure. Is it referring to a generous meal? Nepenthes herba cuius meminit Plinius apud Homerum Penelope. Herb Nepenthes, which Pliny mentions with respect to Homer's Penelope. Huius succo addito poculis / discutit tristiciam convivii. The juice [of Nepenthes] is added to pots [as a flavoring, to] dispel the dullness/monotony of the feast/meal. Nepenthes, cure for forgetfulness [or maybe it means a way to forget your worries], (a power/use that is handed down/descended from Galen). Sunt qui putant esse buglossam / de qua Galienus scribit : quod vino immissa leticie causa sit. 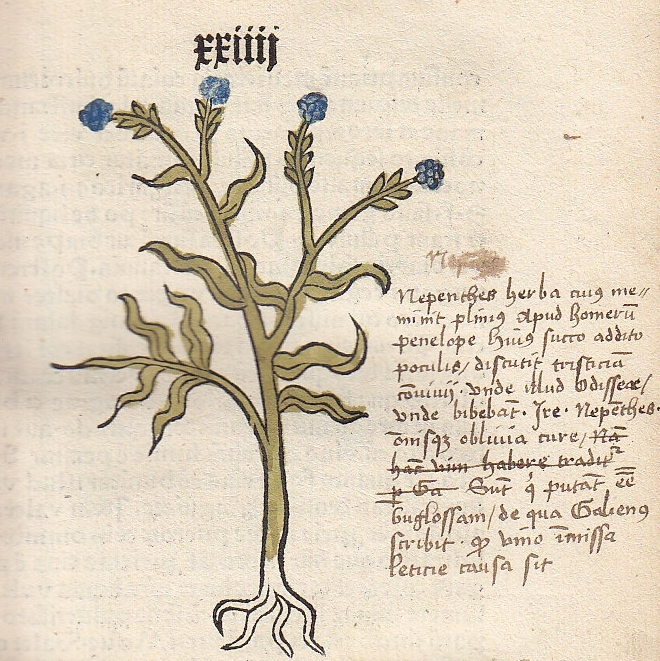 There are some who think it is [confuse it with] bugloss, as Galen wrote : because it is popularly/happily added to wine [or maybe what he's trying to say is that it promotes a happier mood when added to wine].